JK Rowling has apparently now sold 325 million books worldwide. 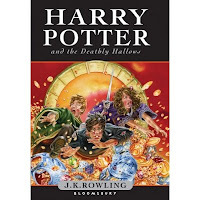 The last four books in the Harry Potter series have sucessively been the fastest selling books in history. She is estimated to have a personal fortune of something like £545m. So I suppose it's fair to say that she's done reasonably well since she first sat down in 1995 and hammered out "Harry Potter and the Philosopher's Stone" on an old manual typewriter. I jumped onto the band wagon at around about the time of the third book, when I quickly devoured "The Philosopher's Stone", "The Chamber of Secrets" and "The Prisoner of Azakaban" and joined the growing throng waiting for the publication of "The Goblet of Fire", which is where it all seemed to go absolutely crazy. I finished the seventh and last book ("The Deathly Hallows") a couple of weeks ago now and to be honest, I'm fairly glad it's over. I was always going to read my way through to the bitter end, but since the high watermark of book 3, some of the magic and charm was gone and the books have got longer and longer and the writing has seemed flabby, as if the publishers now felt that it was more important to get the book out quickly and to milk their cash cow than it was to make sure that the text was properly edited. When C. finished the last book, I asked her if she thought it was any good, and she paused for a moment before saying "No". Clearly this wasn't going to stop me from reading it, but did I agree? Yes, I suppose I did. Sure, it was interesting in places and it held my attention, but I found it largely unsatisfactory and felt mildly confused and a little bit cheated by the ending. By contrast, when I finished the last of Philip Pullman's "His Dark Materials" books, I was in tears. The world of wizards and muggles, of Hogwarts and Gringotts, of Dumbledore and Voldemort is - without question - beautifully conceived by the author. The stories are (in the main) engaging and the characters appealing. But in the end, what is Rowling's legacy? Are these stories that are going to stand the test of time? Rowling would probably be quick to agree that she's no C.S.Lewis, but her handling of the characters and their adolescent emotions was sometimes appallingly clumsy and the dialogue stilted. Consider Hermione for a moment: she was one of the three major characters, and yet after seven books, did she ever become anything more than a crudely drawn cipher of the class swot, sitting in the front row of class with her hand straining in the air to answer every question? Was Ron ever really more than the loyal but slightly dim best friend? To my mind, the answer to both questions is no. We never really find out about Voldemort either.... yes, yes I get the parallels with Nazism and purity of the blood and all that, but are we supposed to believe he was just born bad? Is that how we explain Hitler? Perhaps I'm being too critical. I am thirty-three years old and the books are, after all, intended for an audience at least half my age. Rowling's crowning achievement simply has to be that she got children to put aside their computers and their playstations for a little while whilst they sat quietly and read a book. For that alone, I salute her. Just don't get me started on the ending. Hmmm. I've only just finished the fourth book myself and I've loved them all. Here's some interesting debate about the HP series from one of my favorite sites, Gin and Tacos. Oh, and did you know the first book is called The Sorcerer's Stone in the US? I wonder why that is? I've just finished the last one, and I agree with you that Azkaban definitely represented the high watermark. I think on balance though that after the slog that was The Order of the Phoenix I thought the last two at least pick up - partly I suspect because Rowling knew the end was in sight. At the end of the day, she created an engaging world in which sufficiently blended the real with the imaginary to capture people's attention, and whilst a bit clunking at times she carried it through to a reasonably satisfactory ending. I agree though that it's all about Harry - supporting characters getting little or no development beyond their initial stereotypes (with perhaps the arguable exception of Neville). Still, anything that encourages people to read more has got to be a good thing. I envy her market share and certainly don't begrudge her the success but I'm also pleased I haven't been dragged in. You're more than likely right that quantity overtook quality around the mid stage. I'm surprised the movies didn't follow suit in an attempt to get it all done before Harry and Co. looked to old. Mind you, there's time for that still. I think I was most bothered by the setting(s) in this book. Askaban is also my favorite, although I think Goblet of Fire was just fine as well.